These shown have sold but may be special ordered. Customization requests welcome. 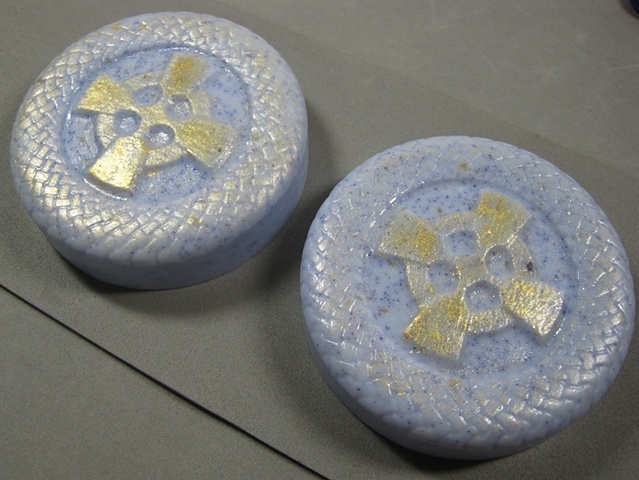 2 bars of Goat's Milk soap with colloidal oatmeal, Lavender & Bergamot essential oils with a few drops of Tea Tree essential oil, lavender color, with dusting of gold mica powder on top to bring out design details. Colloidal oatmeal is made of 100% finely ground oats for use as a home remedy for itchy or dry skin. People with eczema, chicken pox, bug bites, or poison ivy may find some relief from itching and dryness with colloidal oatmeal home remedies. It has also been used by people who have rosacea. Lavender and Bergamot may help to calm the spirit and relieve itchy skin. Tea Tree promotes clear skin although I did not add much to this recipe to avoid a medicinal smelling bar. Lavender is the predominate scent with a bergamot undertone.